Beautiful patterned papers make it easy to create a stunning page in a short amount of time. Here I have used just two papers and a handful of stickers to showcase my photos. The individual elements may be simple, but the straight-forward design makes it easy to put them together. 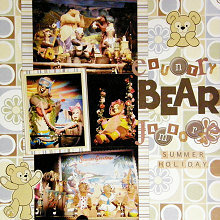 This layout was created using Three Bugs In A Rug Chipper Jovial Paper, Three Bugs In A Rug Perky Stripe Jovial Paper, light brown cardstock, dark brown cardstock, brown ink, teddy bear stickers and an assortment of brown alphabet stickers. Begin by placing a 4x6 photo along the top edge of the Three Bugs In A Rug Chipper Jovial Paper approximately 4.5cm from the left edge. Place a second 4x6 photo inline with the first, only this time along the bottom edge of the Three Bugs In A Rug Chipper Jovial Paper. Place a 3x4 photo in between the two 4x6 photos so that the right edge of all three photos is inline. Cut two 1.5cm strips of Three Bugs In A Rug Perky Stripe Jovial Paper making sure the stripes are horizontal when placed vertically. Ink the edges with brown ink. Adhere one down your page approximately 3.3cm from the left edge so that it slightly overlaps your photos. Adhere the other down your page approximately 10cm from the right edge of your page so that it slightly overlaps your photos. Mat your remaining 3x4 photo with light brown cardstock and again with Three Bugs In A Rug Perky Stripe Jovial Paper. Make sure the stripes are horizontal. Ink the edges with brown ink. Adhere at an angle over the gap between your photos (to the left of the other 3x4 photo). Adhere your teddy bear stickers in place, as shown in the layout above. Cut the letters of one of the words of your title (preferably a small word) from dark brown cardstock. Adhere to the right of your photos, as shown in the layout above. Use a collection of brown alphabet stickers to complete your title, mixing and matching as you choose. Finally, if you wish, you can add a journaling block to the bottom right corner of the page.